Today I posted the text 'Safe Home' in Fade Street Dublin. Some people who live abroad and will not be able to read the text in its entirety have asked me to post it online. As human beings we are constantly trying to deal and come to terms with internalised trauma. Being unable or unwilling to resolve certain issues, we cling even tighter to them and, though we yearn for peace and rest and progress, we can’t seem to let go of that which threatens to destroy us.What is it like to walk away from conflict, to put your weapons beyond use? To dwell upon all the years committed to the never-ending cycle of fright, fight, flight. Resentment, hatred, fury and denial all form part of the energy field that has dominated us human beings for thousands of years. Along with the hardware, these emotions need to be deactivated if the grip that has bound us for generations to armed conflict is to be loosened finally and permanently. Letting go is always a process of loss, a process of grieving. The dawning realisation that you cannot retake what you’ve reconciled to let go of. And the final, slow acceptance that it is no longer of service to you anyway. The grip that binds us is a reflective process, which offers participants a chance to engage with the emotional dynamics that underlie letting go and the emergence of something new. I am a fighter, fighter’s blood runs through my veins. The air I breathe is warrior air created by mankind ever warring with itself. The fight gives me life, fills me full of purpose and cause. Fear can find no home upon me as I travel like a feather upon Apollo’s arrow, higher and faster than Icarus on his wings. I am sworn to earth, to territories and boundaries. I am in all your hearts, surging through all your blood. I am your fighter, brave and strong always at the ready for combat, for rescue. I am ancient and I am new. I am your fighter defending faith, family, land, oil, power, lest other fighters invade our boundaries and steal these things away. I am the spear carrier, to Alexander the Great, one of Churchill’s heroic few, I stood with Irish rebels and independence fighters here and elsewhere. Without me they are nothing. Without me, no war can be fought. - every battle, every defeat, every heroic deed and death is now and for all time written in my DNA. I am that fighter, the one you saw with the flower stuck in his rifle, the one embraced on D-day all across Europe. I am the Russian infantry sergeant, who glimpsed freedom for an instant in a Berlin Street before the wall went up. Sick from the fight and the smell of death, I struggled from outer Siberia to the smashed cabaret rooms of Berlin and the empty beer halls of Munich and I was denied my smiles and ordered to build a wall around my hopes of freedom.. And at checkpoint Charlie two soldiers, once brother and sister in the common cause, now sworn enemies at the ready to kill and maim, to occupy and deny - on and on. Our eyes meet only in our gun sights, hearts pumping with fear. It was an oh so cold ‘cold war’. Covered in frost bites not love bites. I am the child, toy soldier in Africa and elsewhere. I move to the sound of gunfire in my sleep, my dreams. The only numbers I know are on my AK47, my M16. My playthings are Kalashnikovs and machetes and I can’t get home. “The little toy soldier is covered in dust but sturdy and staunch he stands.” Longing for home. I am young and in my prime, a warrior fighting for Palestine, for Afghanistan. Lands I I have taken an oath to die for, to kill for. Lands I will never live in. I wear a waistcoat woven of explosives to keep me warm. Honour is my destiny, my rendezvous is death. My homeland is not of this world. I am a soldier of the God’s. Bobby Sands weapon is starvation, falling toward a hungry grave, so they say, and I, the fighter, hand on heart pledge allegiance to the flag, Pledge that I will carry out my duty to protect my country from enemies without and within. I am a warrior and how I long for home, for my family but it is not to be. I have loved and cherished, and I have raped and destroyed, cutting my ties with humanity as I cut through the throats of my enemies. Letters from home, a sharp reminder, like sniper’s bullets, can kill the will to kill. Love letters in the ashes of Dresden, a bloodied sweetheart’s photograph in a Sarajevo street. Ghostly mementos of nurture and love. Things I have forgotten. They say one has to when one becomes a fighter. The closest thing to me must be my weapon, after that my enemy and the discipline to block all feeling off. I give the grave its reason and its victory. I saw it fill up and swallow the bodies of strangers and of friends. There are generations in there. We fighters work tirelessly for the grave. So whose army is the good army? Which fight is the good fight? Who fought the just war in Vietnam, at the Battle of the Boyne, in East Timor or West Belfast, mainland China. Under attack or attacking, I make my commitment to I witness it all. In the end there are only the fallen. For those, I soldier on, hopeing for home, dreaming.. I was dazzled for a moment by the bright swords of the Samari, the whiteness of the sailors uniforms, the cry that “my land unfree shall never be at peace.” The excitement of the adventure transported me, swept me off my feet. The promises of honour and glory and victory. “It’s not what you can do for your country but what your country can do to you.” I was intoxicated, brainwashed, seduced, bewitched, conscripted, press ganged. And I for my part abandoned myself myself. I packed up my troubles in my old kit bag and smiled, smiled, smiled until I could smile no more. I told myself I was only carrying out orders. That the ideals, justified all the killing, all the deeds, good and bad that I have done, but now , where is homeland? . . . . . . They say it is better to have conquered yourself than the whole world. Better to possess your own soul than the finest treasures. I did the state some service, I say, did the nation some good. I am no hero, nor martyr, fear led me through all my battles. But now all I want is to go home where I can heal my wounds - those inflicted on me and self inflicted. I made my choice as a boy when I volunteered but after that all the choices were made for me as I was press-ganged into unspeakable deeds. Keep a stiff upper lip. Do not scream into the night. Keep the vision of the fight as a means to an end, for a better world. Show no emotion, no mercy, expect none. I only joined up to play soldiers, action man, wonder woman for Ireland, Israel, Taiwan, Palestine, for Manchester United. Now I am cut off from my unit, I’ve lost contact with HQ. I am lost behind my own lines, lost in myself. I have no means to console myself. I am my final enemy. The last battle I must fight is with myself as I grow up in no man’s land. No identity. This, they say, is the bravest journey of all. Where I must take off my blindfold and make a stand. My mind searches around the deeds of my life for the spoils but there is nothing left. There is no home to go to. All the wars to end all wars have brought me nothing. There are no knights of the round table, there is no Samerai. Now must my sword now face me. Where is freedom? My service is done, let me rest. Let me now cloak my memory, wipe it all away for all time, as though it never happened. I am so sick of death by killing but cannot quell my rage, fight, fright, flight. I am weary and my soul is on fire, haunted by the spirits of the slaughtered, tormented by my own surrenders, defeats and betrayals. How can I embrace my foe, put my arms around peace and put my arms beyond use? Unite myself. People died so I might live, in peace, at home. Here in the rubble is everything I fought for, cared for, the cause. I fulfilled my duty, my part is played and I would not have played it any other way. Could not. No choice then, only now. I did the best I could, the good work of the patriot, the dirty work of the guerrilla fighter. I was trained by the Americans to fight the Russians in Afghanistan, the Imans in Iran, and the communists in mainland China and I fight on now in the Baghdad streets in Madrid and in New York, London. I am terrorised. ‘To win without fighting is best’ Sun Tru said, but I was recruited with promises of wondrous things. I was going to free the world, unite Ireland, liberate Kuwait, free Taiwan, bring freedom like clouds bring rain. You gave me a shield, an armoured car, smart bombs and a spear for to lance the side of the Christ and others, I have done the deeds for the cause. There will always be something to struggle for, to fight for, to be angry about. I am truly sorry for all those killed. But the conflict was not of my making and I will not wear sackcloth and ashes for somebody else’s shame. Now, I march the death march a requiem to the folly of war. I am a fighter from the first to the last. Remember that is what you needed me to be. But now that I am too worn for war I am left to fight for peace in my own heart,fight myself, while the last post sounds and falls on deaf ears and closed hearts because tomorrow begins a new recruitment drive against the new enemy, for new fighters for the new war in the same old places, same old story. My fighting days are over and now I bear witness to it all, stand guard like a sentry over the reality of what happened. They say the first casualty of war is the truth. I say the first casualty of war is a fighter and this truth will set me free. There is no truth like home truth, this is my homeplace, I long to get home. 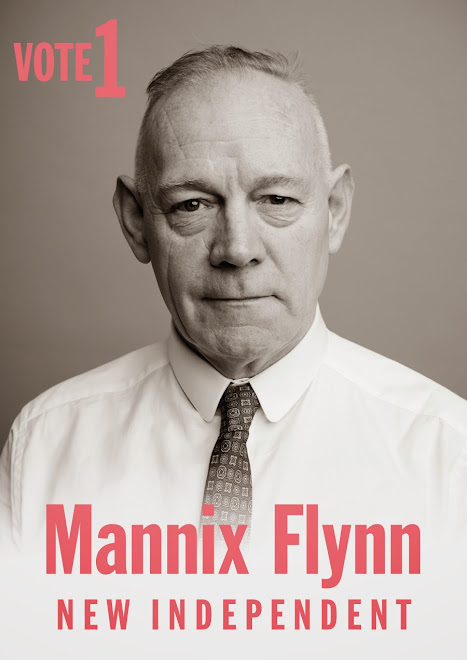 As an artist, Mannix Flynn is an advocate for transparency in public life. He brings this same value to his role as an independent city councillor, calling people, or more usually organisations, to account for decisions from housing allocations to cavalier spending of public money. The apparatus of the State should serve its citizens, yet many of us struggle to negotiate complex public service systems. Mannis feels the role of a councillor is to help people access their entitlements, not just financial entitlements, but entitlements to information, education, training and culture.